In dog rescue, we obviously take on the role of angels for all the Border Collies who need our help. But sometimes, there is a dog who is an angel looking after us. Well, this is one of those sometimes. Meet our sleek and striking angel, Angel. An approximately 9-month-old female tri-color Border Collie mix, Angel came to us when her foster parent needed her most, and, the thing is, Angel needed her just as much. Angel entered our rescue as a tiny puppy with a broken femur, which required surgery. But she came through it with flying colors and shows no ill effects to date. Angel now loves to use all of her healthy legs to easily run and play with other dogs. At her first adoption event, Angel was, well, a perfect angel. She greeted every human and dog that came through the front doors with perky ears and a wagging tail. 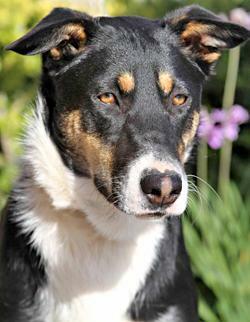 Angel has been great with the children she has met and would be a great family companion. She also rides nicely in a car, is pretty good on a leash and loves to play with other dogs. In fact, Angel can make funny noises when really excited during play time, and her foster parent feels it is quite adorable. Angel would love for you to provide any or all of the following: play throw-and-catch with a tennis ball (don't worry; she will bring it back), set her up with a kiddie pool and/or fill her life with squeaky toys. She also is great in the house at night (she has a no-accident record!) and sleeps through the evening in her crate (so she is crate-trained). Lastly, Angel is quite fond of her foster brother Kody, and we'd love to see them placed together in a home looking for two dogs (although she can be placed separately). Either way, you should really add this guardian Angel to your life. You won't be disappointed! As described below, Angel came to us with a broken left femur and is listed as one of our "medical needs" dogs to help us recoup some of her vet bills. She is now fully recovered and ready to find her forever home. Look how she's grown! Angel, a tri-colored smooth coat BC, is a little over 6-months-old now. She is a very playful girl who loves to play with other dogs. She will retrieve a ball, is good on a leash, is crate-trained and knows how to use a doggie door. Angel has a very sweet disposition and loves to be around people and other dogs. She has not been tested on cats, but due to her high herd drive, we would recommend a home without them. Angel just loves to play. Due to her activity restriction during healing from surgery, she is very comfortable sleeping and eating in her crate and will sleep there all night long without incident. Angel has a very special place in her Foster Mom's heart and needs to go to a very loving home. She would be ok with another dog to keep her company when her humans are not around. Angel is being fostered in East San Diego County. Adopters must be committed to working with the destruction and energy associated with raising a puppy, along with housebreaking accidents. As with all puppies, socialization and puppy obedience classes are a must. This will ensure that you will have an outgoing, socialized, well-behaved, and well-adjusted adult dog in your family. Kody's adopters will be required to complete a puppy questionnaire, as well as complete her series of puppy vaccinations, including rabies. In addition to her adoption fee, a refundable deposit is required to secure her sterilization, in accordance with state law. Lassen is the best puppy-sitter!! Angel and he are inseparable! Angel is getting along famously on her leg. I have been letting her out twice a day into the big yard with Lassen and Ellie. Angel and Lassen are best buds. He takes her into the shop, which requires using a doggie door, and they lay down in there to keep cool. She goes back to the vet for more radiographs on Thursday to make sure everything is healing properly and she should get the go-ahead to be adopted. She is an amazing little girl and will be sorely missed. Her front end looks like a Bulldog because she's had such limited use of her backend, but the muscles will get stronger as she is able to use both back legs. She has quite the "doganality", as I like to call it. She is typical puppy and BC. She is a total water dog, loves the kiddie pool and her water bucket. Angel had her sutures removed last week and is doing fantastic. A little too active for recovering from a broken femur, but she's doing great. She has a plate and pin in her leg, her mobility is coming back, and she is putting a little weight on the leg. You would never know she had a fracture by looking at her now. She loves being outside. I put 2 X-pens together for her with an Easy-Up as shade with a small doghouse...she as happy as can be! She really wants to get out of that yard and play with the others in the big yard. Angel does quite well in the house for a puppy. She loves to play fetch with her inside toys and doesn't have any accidents in her crate at night. She loves her crate already! On Friday, September 3rd, an adorable 3 months old BC mixed pup that is now affectionately called Angel, was bailed by Valerie (one of our foster homes). Without BCIN, Angel had no chance of making it out of the shelter, as she required major medical treatment for injuries to both of her back legs. One hind leg had a complicated break and the other had been fractured. This darling dumpling underwent extensive surgery on 9/4. The vet inserted a plate and a pin in the leg that was broken. The plate will be permanent and the pin may be removed later since it went down the center of the bone. Radiographs of her right hind leg revealed that she sustained a fracture that had already healed. The vet left it alone because it does not bother her. For being only 3 months old, our Angel has had a really tough start in life. But thanks to the folks at BCIN, she is now safe and on the road to recovery under Val's attentive nursing and tender loving care. Her prognosis for recovery is excellent. Keep checking our website for updates on Angel's progress. 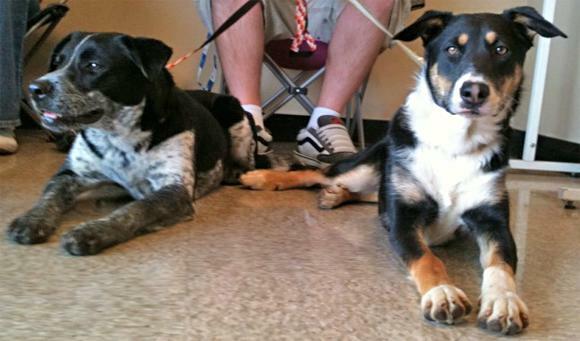 Copyright © 2011 Border Collies In Need, Inc. All Rights Reserved.